How much sleep is right? Insufficient sleep is a public health epidemic. The US Center for Disease control reports that 35% of Americans do not get enough sleep and 38 fall asleep during the day unintentionally. Oh boy.The National Sleep Foundation reports that Americans think they sleep enough but ⅓ say their quality of sleep is poor. Good lord!!! As a nation we are under-rested, overstimulated and overwhelmed. The majority of people run around like mad chickens or have an internal attitude of stress rather than ease. How can we even notice we are sleep deprived when the majority of people around us are that way? Like one of my Ayurveda teachers says, 60% of society is so sleep deprived, we need to sleep for 6 months straight. I could not agree more judging from what I have seen in my practice. Take a few seconds and tune into your body right now! Just take a breath. How does it feel? It just takes one breath to notice. It is likely you will notice how fatigued you really are. In Ayurveda sleep is one of the three pillars of health which means it is a foundational piece to our well-being. Have it and you are healthy and feel good. Don’t have it and the Lord better be with you. Let’s break this down. Society and Sleep: What is our sleep culture? Let’s presence ourselves with what is currently happening in society. I venture to say it is cool to eat and drink whenever we want and however much we want. It is not so cool to rest whenever we want or however long we want. The push-it-through kind of attitude is everywhere, sometimes more pronounced, sometimes subtle; you better achieve and do. Rest is the last thing on the agenda and only allowed when one has accomplished something, anything, whether that is work, sportive activity, doing the laundry, cleaning the kitchen in a most timely manner after a meal…whatever it is. Being lazy is so not okay. It’s like we need a specific excuse or permission to rest. The day I presented myself to my own pattern around resting is when I was living in India for 6 months in 2003. I was doing a yoga therapy training and living in a two-bedroom apartment. One day, a Korean lady moves in. She was living living in India meaning she had lots of stuff. For two hours she would mossy around, move in boxes, mess up the place then disappear for 30min. Where the heck is she? She reappears and mossies around some more for a couple of hours making an even bigger mess. Then I find her sitting in a chair reading a book. What the f&%$ is she up to? Can’t she get things done and over with? The pattern repeats all day. Moving for 2 hours then reading, moving for 2 hours then napping, moving for 2 hours then going for a walk. What kind of work ethic is that? Doesn’t she know how to work???? I was irritated. And then I got it…OMG she is resting in the middle of chaos to gather her strength and be more efficient in her move. And the killer for me was …..SHE WAS OKAY WITH THAT…and I wasn’t. At that moment I realized how f%$&ed up my attitude was around resting. I venture to say that in our yang/male/achievement oriented society there is a great likelihood that you feel that way too…my old way I mean. During the second half of 20th century the overall sleep duration decreased by 1.5-2 hours per night. That is a significant 25% which means if you had typically slept 8 hours in 1950, now you only sleep 6. Yikes! The National Institutes of Health suggests that adults need an average of 7-8 hours of sleep but nearly 30% of adults reported an average of less than 6 hours of sleep per day (2005-2007). Teens need an average of 9-10 hours and children at least 10 hours but only 31% of high school students reported getting at least 8 hours of sleep on an average school night which means 70%……you gotta digest that number 70%….. did not get enough sleep. As a society we have an energy integrity issue. Clearly!!! What’s at stake when we don’t rest enough? And if that is not enough it can also lead to obesity, depression, bipolar disorders or seasonal affective disorder. When you go to bed too late or don’t get enough sleep you train your body to produce cortisol, one of the major stress hormone, around 8 pm. A study by Van Cauter et al on the impact of sleep deprivation on hormones and metabolism says this: “Elevations of evening cortisol levels in chronic sleep loss are likely to promote the development of insulin resistance, a risk facts in obesity and diabetes”. Cortisol is stimulating and prevents you from winding down. Too many stress hormones at the wrong time is depleting and disrupting the endocrine system. Not good! Statistics say adults need an average of 7-8 hours of sleep per night. That’s a nice benchmark to wrap our minds around. The problem is which one of us is statistical average? No-one. The amount of sleep depends on a lot of factors. What activities have you done that day? How much did you work vs play? How much did you pause in between activities? Did you take a decent lunch break? How did you sleep the night before or the night before that? What’s the quality of your sleep? How much computer time vs nature time are you getting? How stressful do you experience life i.e. what’s your attitude towards life? Are you recovering from a trauma, surgery, or illness? What’s the amount of emotional stress you are experiencing? Have you travelled a bunch recently? Do you care for little children that wear you down? Have we engaged in a lot of mental activity lately e.g intense study? You get the picture. Sleep can vary dramatically according to these factors and many others. This is not an exhaustive list. I know for myself I need more sleep than I’d like to admit. Ideally I only want to sleep 6 hours because my need for great accomplishments requires lots of time. But often I find myself only deeply rested when I sleep 9 or 10 hours, sometimes more depending on the season or any of the factors above. If sleep depends on all these factors how can we figure out how much sleep we really need? The answer to that question goes back to the body. 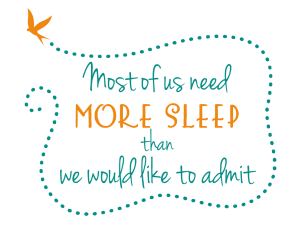 We need enough sleep, so we feel deeply rested. It’s as simple as that. The body knows the answer we just need to stop and care to listen.